Searching for an off-the-beaten-path beach destination where days are lazy, beaches are crowd-free, views are unobstructed and sunsets are amazing? Maybe you are even thinking such a place no longer exists. Let me introduce you to my new found love on the Florida panhandle – Mexico Beach! Mexico Beach is a quaint little seaside community situated in the southernmost part of the Florida Panhandle about 30 minutes or so to the east of Panama City. This unique five-mile beach town sits directly on the Gulf of Mexico close to the mouth of St. Joseph Bay. It is reminiscent of “Old Florida” with only a two-lane highway, no traffic lights and the absence of both chain restaurants and busy shopping malls. Many folks refer to it as the forgotten coast…others call it the unforgettable coast. I say both are accurate. Since 1946, Mexico Beach has stayed true to its roots with no high rise condominiums, which allows them to specialize in niceties like spectacular gulf views and balcony sunset watches. Colorful hues dot the topography in the form of beach houses and little shops. Folks seem happy here…they pause to wave at their neighbors…they ask where you’re from. In fact, if Mayberry was set on the beach, it would certainly be Mexico Beach. Mexico Beach embraces a laid back ambiance where vacationers can do nothing at all or load up an agenda with a shelling tour, fishing expedition, water recreation, biking, shopping, golf or other activities. Sea shells are plentiful on the shoreline and many folks find their contentment just strolling along and searching for the right shell souvenirs. Others enjoy booking tee times at nearby golf courses or scheduling charters for fishing or scalloping excursions. A favorite memory from my trip was Captain Mitch Coleman from FloriDaze Adventures taking us on a charter boat to view the area. Captain Mitch knows these waters well and navigates with a sense of confidence that is really appreciated in a boat captain. He is available for shelling excursions at Crooked Island or fishing expeditions (trolling, bottom fishing, sight fishing, and other sport fishing). Let Captain Mitch custom tailor an adventure for your group or family and enjoy a day on the water! And then there’s the beach bum who loves the sound of the crashing waves so much that laying on a towel on the sand or sitting in a beach chair provides all the entertainment ever needed. Mexico Beach certainly provides the atmosphere for that! Whatever your pleasure, don’t forget to leave some time to meander through the one-of-a-kind shops along Highway 98 and find treasures of jewelry, clothing and other novelties to carry home. After spending time in Mexico Beach, I have found some family options for fun and relaxation that are sure to add pages of beautiful memories to your vacation scrapbook. Of course, the first stop to make when you enter Mexico Beach is at the Welcome Center by the docks. Pick up brochures and ask for information there, then head across the way to the HUGE beach chair that serves as an excellent photo prop! Walk along Highway 98 and duck into cute little shops and just enjoy the scenery. Take a fishing pole out to the beach at dusk and fish right from the shore. Fishing tackle, license, gas (if you have a boat), ice, live and frozen bait, and such can be purchased at the Marina, as well as apparel for men, women and young anglers. Walk along the beach at night with flashlights and search for critters. Get an ice cream at Tommy T’s (it’s Blue Bell!) and walk the pier. Rent bicycles and bike the five mile beach town. Pick up groceries and other necessities at Gulf Foods on the left in the center of town (on 98) or Dollar General (a little further down). There are some fabulous eateries in Mexico Beach, but keep in mind this sleepy little town rolls up the sidewalks early, so plan to eat before 8 or 9 p.m. There are many options listed here and all are unique offering totally different menus and atmospheres. Take some time to check them out and tease your palate with all the tastes of Mexico Beach, where you won’t find the standard chain restaurants. Toucan’s offers a fabulous assortment of fresh seafood, pastas, salads, burgers and sandwiches, not to mention wonderful desserts. The sweet & spicy shrimp and crab cakes are among this family’s favorites, but you’ll find your own temptations easily enough. Equally enjoyable is the atmosphere and view at Toucan’s. And after dinner, take a stroll through the gift shop for souvenir tee shirts and other memorabilia. Don’t miss Toucan’s where their tagline is right on target – a quaint little drinking village with a fishing problem! Killer Seafood is on the other side of Gulf Foods and while the outer appearance is quite humble, the inside offers seafood delicacies that are…well…killer! Choose from baskets of fried or grilled seafood (shrimp, scallops, oysters, fish, crab cakes, etc.) served with hush puppies, fries or slaw or try the killer fish tacos! They also serve seafood Po’ Boys and killer key lime pie! *NOTE: This restaurant accepts cash only so be prepared. Mango Marley’s is a fun, family-friendly place to catch your favorite sports team and enjoy awesome wings or a signature dish like Floribbean Fowl (jerk grilled chicken with bacon, cheese and tomatoes served over black beans and rice) or bacon wrapped tiger shrimp served over yellow rice with mango salsa of course! Wash it all down with a Watermelon or Mango Margarita! The Fish House is an excellent choice for breakfast, lunch or dinner. This family-friendly restaurant offers a casual dining venue specializing in fresh seafood at affordable prices. In fact, every day from 11 a.m. to 4 p.m. they have a shrimp basket for $6.99! They have won multiple gumbo cook-off awards and feature oysters, shrimp and prime rib daily! Crazy Beach Pizza is good especially for a night in the room or on the deck and they deliver! Sharon’s Café is conveniently located on 98 as well and is the Mexico Beach version of a Waffle House-type restaurant serving really good strawberry and blueberry waffles as well as the standard steak and fries-type menu. Also, pop in at Caribbean Coffee for specialty coffees and browse the adjacent art gallery…what a surprise! Graba Java is another option for coffee and breakfast (also good waffles). Both coffee shops are on 98…in fact, all of the restaurants mentioned are right on the main drag Highway 98 and visible from the road. For a night of entertainment, karaoke and drinks following dinner, head to Lookout Lounge. The locals hang out here…and it is an awesome place to watch the sun set while sipping on your favorite beverage! Mexico Beach does not offer dozens of high rise condos stacked one on top of the other creating beach crowds and riff raff, but what they do offer is low rise condos, motels, inns and beach houses. For all your lodging needs, Forgotten Coast Property Management can direct you to the level of accommodations that best suits your family or group. They connected me with two units that were nothing short of spectacular. The first was a five bedroom duplex (Starr Dust 2) situated directly on the beach only steps from the water. This unit is perfect for a large family, multi-families or a large group. It sleeps 16 and offers great space to move about and enjoy your time on the beach. A fully-appointed kitchen, outside grill and balconies on every floor make this place ideal for vacationers. It is clearly one of the premier beach houses on this strip of gulf coast. The owners spared no expense in the comfort and decoration of this beach house and graciously allowed me to visit there for a few wonderful days. 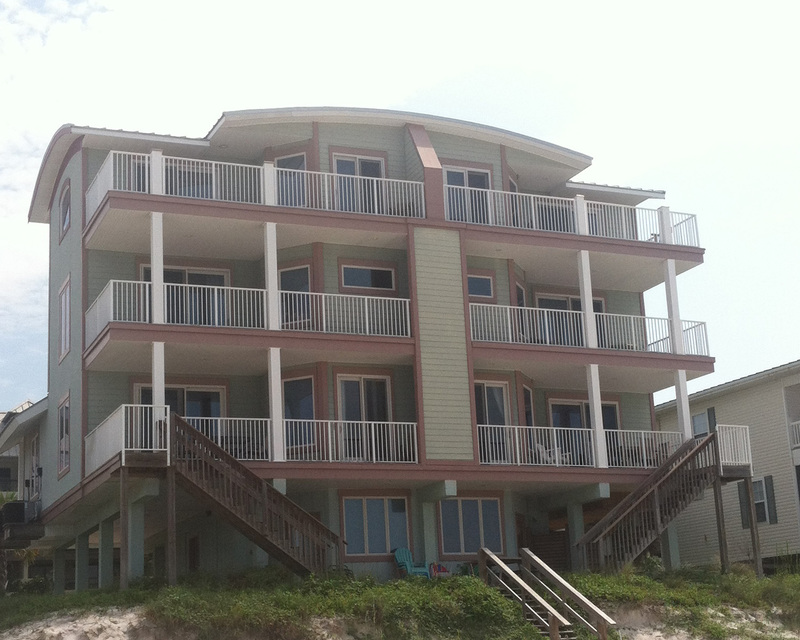 Ask for this unit and be the envy of all the beach vacationers! Across the street from this unit sits the low rise condominium complex The Club at Mexico Beach where we stayed in unit 2L for a few days. This three bedroom two bath spacious unit is located on the same level as the pool (a definite plus) and offers a gulf view from the balcony even though it is across the street from the actual beach. There is only a two-lane highway and extremely short walk between this condo and the beach, so that is not a concern. The owners have this unit professionally decorated and the kitchen is fully equipped with everything you could need. Sidewalks run throughout the village for easy summer strolls. This is another ask for by unit number that you are sure to enjoy if you are a single family and need to sleep up to six folks. Mexico Beach is the perfect getaway for those seeking quiet beaches with an Old Florida style. It is a place where the sand beckons sun worshipers while the juxtaposing water calls to the fishermen and the outdoor enthusiasts. It is designed for the person who loves the quaintness of no stop lights and the eclectic character of multi-colored beach houses. It is for those who desire to please their palates with fabulous beach cuisine in quirky little restaurants. It is for those who enjoy an ice cream in one hand and a fishing pole in the other. But mostly, it is for those searching for the unique unforgettable piece of Florida gulf coast. Mexico Beach was included as one of 5 Southern Summer Trips That Helps Stretch Your Vacation Dollars. My trip was hosted by Mexico Beach Tourism. Photos and opinions are my own. Video is courtesy of Video Visions and the fabulous Phillip Pritchard. Thanks for inviting the whole world to this treasure! I’ m sure it wont be this pristine ,quaint, quiet, unspoiled and untouched the next time you want have a peaceful time in the unforgotten coast. Some things are better kept to yourself.